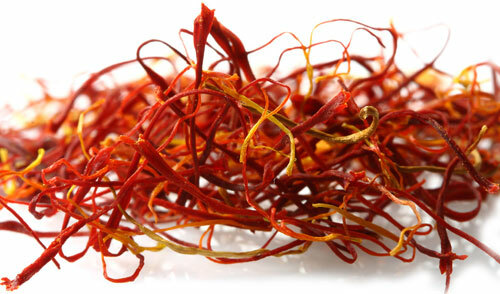 While talking of Aromas and Flavors, how can I forget the world’s most luxurious and aromatic spice ‘ Saffron ‘. Known as the ‘King of Spices‘ and ‘Red Gold‘, it is the Louis Vuitton,Jimmy Choo, Lamborgini and the Blue diamond of the spice shelf 😀 . It can cost up to $2000/lb. But luckily a little saffron goes a long way. It is sold in 1/2 or 1 gram packs as well. 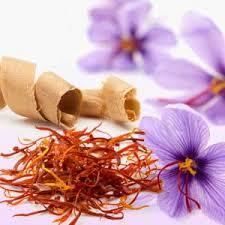 Because it is very intense both in aroma and flavor, most recipes call for just a few strands of saffron. Saffron threads are usually soaked in warm milk or water to release the natural flavors and color before adding it to the dish. This chicken recipe is one of my favorites because it has a beautiful combination of flavors apart from the saffron. Warning: Make this dish only if you are willing to welcome a few uninvited guests, because the aroma wafting out of your kitchen is sure to tempt your neighbors. In a deep bottomed pan/wok, heat the oil and brown the onion paste. Then add garlic paste and saute. Add the marinated chicken. Saute for a couple of minutes. Cover and cook till chicken is done. Soak saffron in half a cup of warm water for ten minutes. Put this liquid along with the saffron and cashews in the blender jar and make a smooth paste. Remove the lid from the pan and add this paste into the chicken. Cover and simmer on low heat for five minutes. 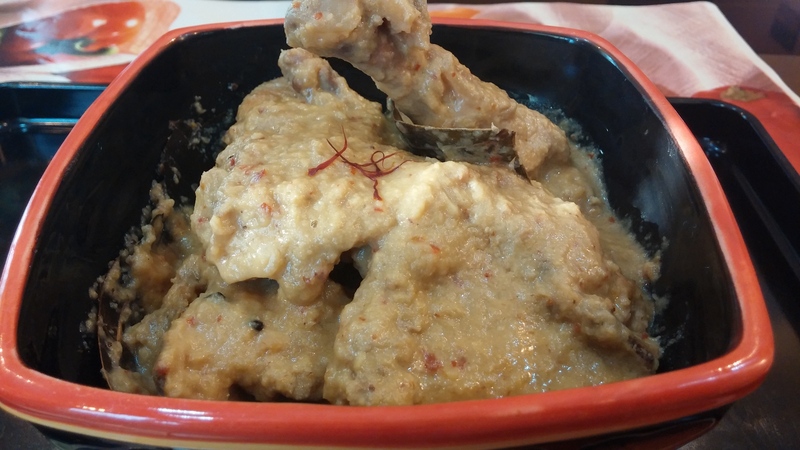 Serve hot with rice or breads.Enjoy this deliciously aromatic chicken with your family….. I am bringing this dish to Angie’s Fiesta Friday 37 which she is co-hosting with two awesome bloggers Julianna @Foodie On Board and Hilda @Along The Grapevine. 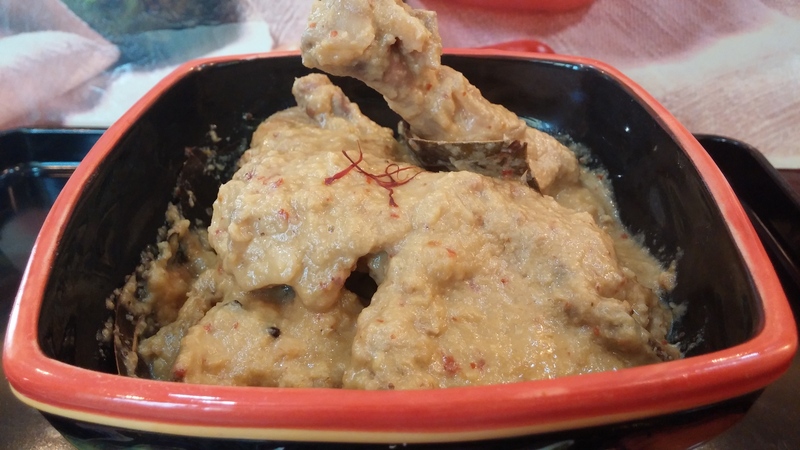 Come along with me if you want a taste of this delicious chicken along with so many other exotic dishes in the party……. 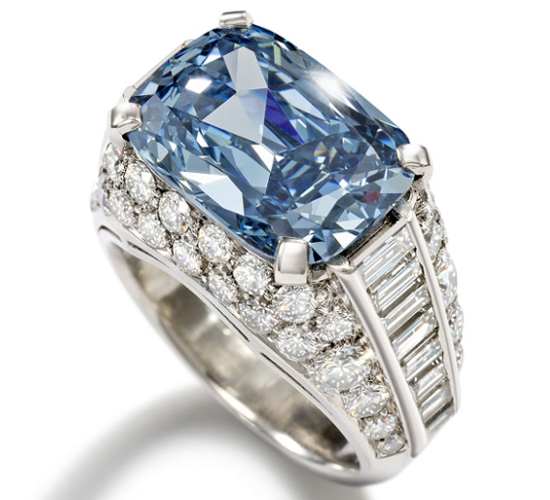 Worlds Most Expensive Engagement Ring Blue Diamond. 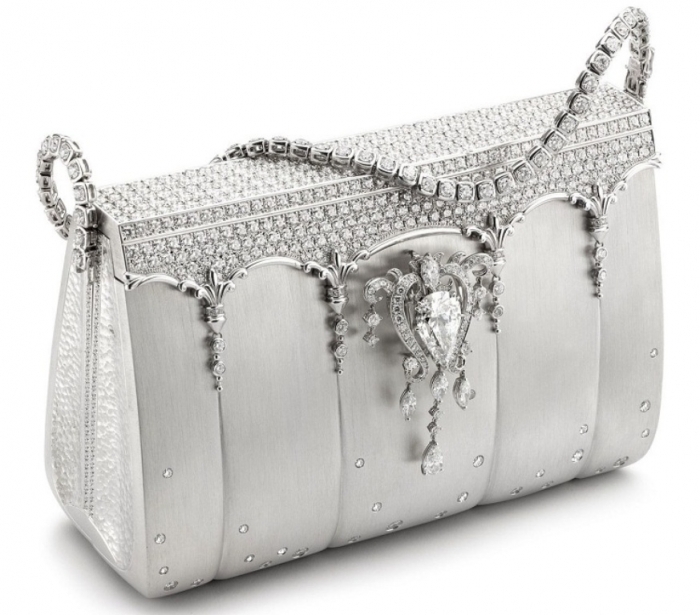 The Stone is guarded by brilliant cut diamonds and baguette cut diamonds along the sides of the ring. Sounds yummo, definitely going to try this out. Yeah please do 🙂 I am sure you will love it dear…. Mmm Mmm, thanks to your wonderful descriptions I can almost smell the delicious aroma emitting from your kitchen…now if I could only taste the wonderful flavors, too! 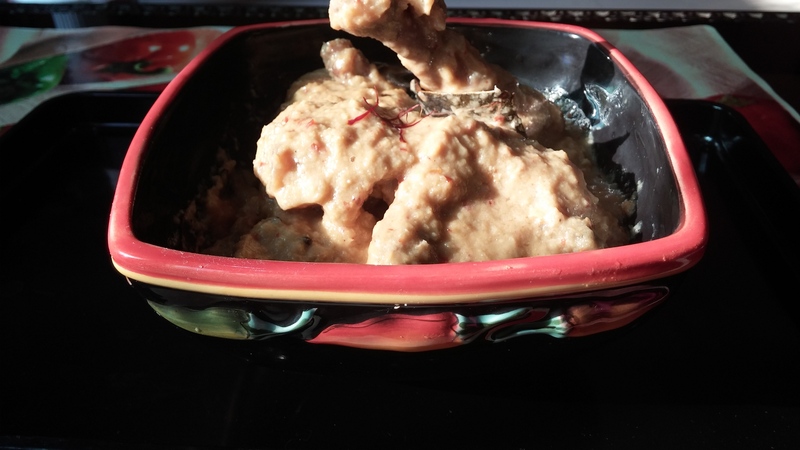 Spectacular looking dish, skd….I only wish I had read this before putting my chicken in the oven this evening! I just planted fifty saffron crocuses (croci?) but they won’t bloom until next year. So meanwhile I am going to have to stock up on some more of this spice so I can make this. I’ve used it with chicken in paella before, but not on its own in a yogurt sauce like this. Much more practical for me than paella! And it looks simply delicious. Many thanks. Must admit I’ve never tried Safron before but I think I will with this recipe. Also never cooked with blended cashew nuts. Can’t wait to try this! Thank you dear 🙂 It is a beautifully versatile spice. 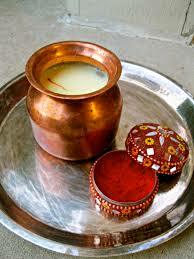 Saffron milk is also relished by many. Thanks a lot 🙂 This is one delish dish. The color it imparts is so beautiful. This dish sounds amazing! I also like the look that the saffron adds to your dish. Thank you Julie 🙂 I couldn’t capture the color properly. It really looks and tastes awesome. I have never used saffron….this looks great! Yummy Yummy 😀 Thanks Nell! I still have no luck finding saffron in this region of the country. It looks a bit like sappanwood… I wonder if i can use it as substitute… LOL! I am not sure the flavors will be the same….